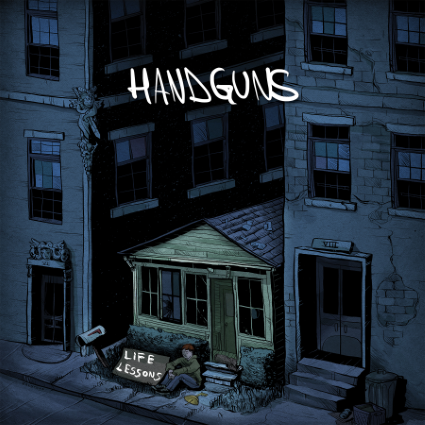 The Pop-punk group Handguns releases their album Life Lessons July 8 on Pure Noise Records. The group has recently had great things going on from a very successful tour with All Time Low and Man Overboard to their upcoming tour with Hundreth and Counterpars. They are a fantastic live group that certainly puts on a fun set every show (that’s said having seen them three times in the past year!). Their recent tour has built the hype and excitement for this new record even more because their single “Heart vs. Head” was extremely well received. The question on the minds’ of many was whether or not the rest of Life Lessons would live up to what “Heart vs. Head” had established for the record. Life Lessons was certainly an enjoyable and well put together record on the first listen, however, it is one of those albums that grows on you even more as you become more familiar with the songs. It is the type of record you find yourself wanting to play over and over and love each song more with every additional play. The first song to really standout is the second on the album, “Sleep Deprived”, from highly relatable lyrics to a catchy chorus and extremely high energy music it is sure to be a fan favorite. The lyrics “And it hurts to say that I looked up to you” showcase the raw emotion behind the song that just about everyone can relate to in one-way or another. Most people have been let down by someone they are close to and know how painful that can be. As the song progresses the angst and anger build as clean vocals shift into a mixture of clean and unclean screams in the middle of the song, both of which are extremely well done and demonstrate nicely the skills of frontman Tyler Eby. The song also showcases the graceful and smooth transition from a heavier sound into the acoustic sounding chorus with “I’m done losing sleep over this and every stupid thing that you did” being sung softly and calmly after it was among screams seconds prior. The music goes perfectly with the meaning behind the song of accepting what has happened and the transition from being angry to moving on. The song has an absolutely perfect pairing of the meaning and music. “Heart vs. Head” is the single that was released earlier this year that was very well received by fans. At both the Albany, NY and Sayerville, NJ shows fans screamed along clearly very familiar with the song despite it not having been out too long. This is yet another highly relatable song as at some point everyone has faced the battle between their heart and head. The guitar and bass work by Kyle Vaught, Brandon Pagano, and CJ Wilson is very strong and particularly noticeable in this song. The fast paced rifts are fantastic on the album and even more enjoyable live! “The Loved Ones Who Hate Us” is yet another fantastic track off of Life Lessons that will certainly allow fans to connect to both the music and the band. “I walked out the door to wander the city and I asked myself if anyone still cares” are extremely powerful lyrics that really resonate with anyone who has felt abandoned or neglected by those who are supposed to matter most. Such heartfelt and emotional lyrics allow the fans to develop a rapport and connect with the band more which creates a closer and more dedicated fanbase. This song is yet another song which really seems to have a great deal of emotion and heart poured into both the lyrics and the music. The entire album clearly touches on highly personal and emotional moments but none as much so as “Waiting For Your Ghost” which goes through the loss of a loved one. “I just wish that I got to say to say I loved you one last time, but I’ll smile up at the sky with your memories in the back of my mind” really hit home to anyone who has lost someone they care about. The song can be extremely hard to hear but at the same time very cathartic as it is a good release of emotion and enables fans to connect with music on a very personal level. As much as losing a loved one is very difficult the song also shows the hope of seeing the person in your dreams and holding onto them through memories and dreams. Life Lessons overall is an absolutely fantastic album that clearly has a great deal of heart and feeling put into it from all involved. The record reflects significant growth and development as a group and as individual musicians for Handguns with very open and raw lyrics and poise and grace in transitioning among the various sounds the group encompasses from unclean vocals to a classic pop-punk sound and even a bit of acoustics mixed skillfully throughout. It is sure to be adored by fans and catch the attention of those who may not have heard or supported Handguns prior. After listening to the album multiple times it has become one of my favorites so far this year! It has certainly set the bar high for Handguns in the future. Life Lessons gets 4.5 out of 5 stars. ← Interview with Illuminate Me!